I have a problem. I’m a perfectionist. Most of you probably don’t think that’s a big deal. It is. Don’t worry, I’ll tell you how this relates to Achilles in a second. Anyway, I write things and get so anxious about publishing them in case they aren’t perfect. I’m terrified that people will hate it or think I’m crazy or stupid or incompetent. I worry that I’m not putting my best foot forward or that I’ll be misunderstood by some of the readers. This is actually the main reason I’ve been blogging more here and why I made Sell with WP – I force myself to write and publish and put myself out on the interwebs permanently. I do it is to force myself to accept imperfection. One day I’ll write a perfect minimalist novel. I’ve heard that Breakfast at Tiffany’s is as close to perfect as a book can get, and I’m afraid to read it in case it is and there’s no more room for perfection. But maybe I’ll write my chef d’oeuvre and not a word or comma will be misplaced or poorly chosen and I’ll have arrived. But I’m not there yet and it kills me sometimes. And it’s hard to accept that and to acknowledge that perfect isn’t synonymous with good. Why are all of those about anxiety? What does that have to do with Achilles? If you didn’t read them (or at least skim), it’s okay, go do it. They’re important articles and I’ll still be here. I’m not necessarily a workaholic like Charlie was. I don’t necessarily have the same anxiety issues. However, I do have similar unhealthy thoughts and views. So here it is – the ugly truth. I am really afraid of failure. Sometimes I blame it on having integrity and not wanting to give up – y’know, “Never Give Up, Never Surrender!”: Galaxy Quest-style. I can’t stand the thought that my life may not have meant something or that I didn’t affect change in the world in a positive way. That’s why no one will remember your name. My need to be productive and constantly working towards my goals stems from that fear, and results in me feeling bad about spending time doing something other than working or learning. Don’t get me wrong, I love to learn. I love to read. I even like to work – I couldn’t not work for the rest of my life since I love challenges. The problem is that I think that I constantly have to be on the path of productivity and self-betterment. Really? Yep. I even use Rescue Time to track myself while I’m at my computer and I’m disappointed if I slip below 85-90% productivity (I know, I’m crazy). You want the whole truth? I’m even having trouble writing this post right now because I feel like I should be doing “more valuable” work. I’m reminding myself that (a) writing for myself is valuable, and (b) I should take time to do exactly what I want, as I’m writing this. I’m taking a leaf out of Charlie’s book. I’m trying to give myself permission to play and to enjoy things. It’s really hard to stop worrying if everything I write or do is “good enough” or if I’m constantly being productive. I’m learning that productivity isn’t necessarily the goal in life. I also think it alleviates a lot of stress and allows you to be present in the moment and to fully enjoy what you’re doing. So far, the attempt to change my thinking has made me feel less stressed already. Yes, I want people to remember my name, but how they remember it and what it’s tied to are important as well. I’m ambitious, but do I only want to be remembered for ambition or drive? Don’t I want to be remembered for my humor and capacity to love? Don’t I want my family to remember that I’ve always been a goofball and will never grow up? 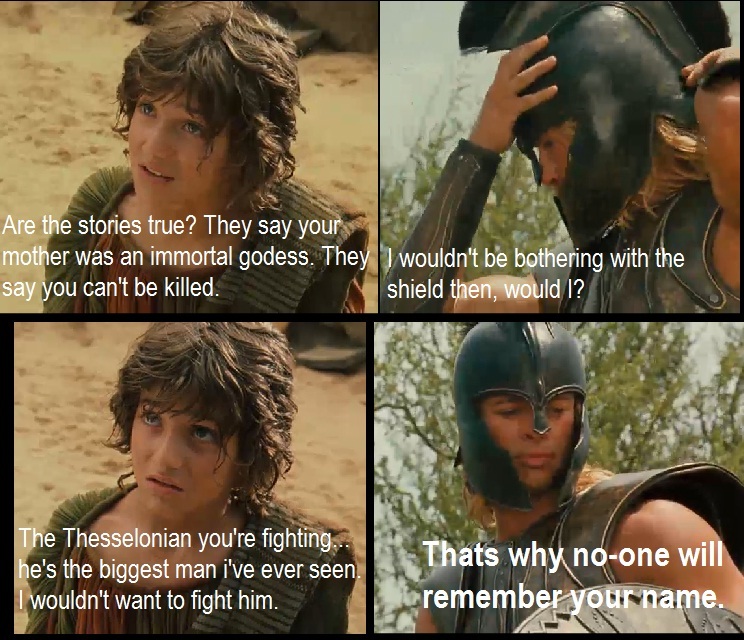 So should I be Achilles? Should I worry more about being remembered or achieving “greatness” than being in the moment? I don’t know. One of the things that drives me is the belief that I can do great things and to make the world better, and that’s really important to me. However, I think I’m coming to the realization that I don’t have to metaphorically whip myself to get there; that achievement and fun aren’t mutually exclusive. I’m learning that I enjoy playing still, and I shouldn’t feel bad when I binge read for a couple of days at a time. That even though I’ve always liked being spontaneous, it’s okay to be that way. I guess the question isn’t whether I want to be Achilles. Instead, maybe we should ask ourselves this: How do I want to be remembered ?